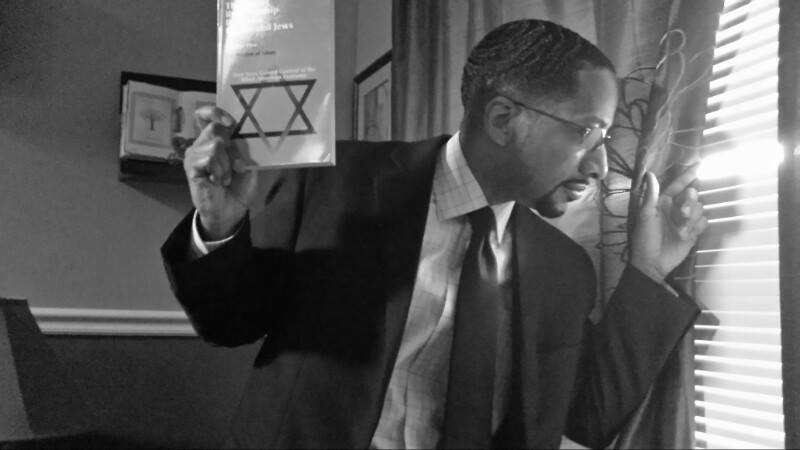 Black Jews have begun to raise their voices about what they perceive as a hypocritical racial duplicity by their white Jewish brethren. They see white European Jews—also known as Ashkenazi Jews—as on the one hand claiming the historical mantle of an oppressed race, but easily toggling back into whiteness to access the multiplicity of privileges of institutionalized White Supremacy. Meanwhile, from their advantaged position white Jews deny or ignore the racism faced by Black Jews and make little or no effort to truly ameliorate racism or to upset a racially skewed system from which they derive such profound benefits. In a Forward response titled “No, Ashkenazi Jews Are Not ‘Functionally White’,” Mr. Danzig insists that Jews are a separate and distinct “race” that has suffered for their Jewishness. But to make his point and to belittle the Black Jews, Danzig propagandizes a fake Black history, contorting three episodes into unrecognizable remnants of actual events. In fact, when placed back in their proper historical context, all three of his examples demonstrate the very opposite of the Jewish victimhood narrative that he intended to promote. His examples instead show that Jews are among America’s most prominent purveyors of white supremacy and that their vicious and hateful reaction to their own Black “brethren” is—historically—not the least bit surprising. Danzig framed his argument via the case of Walter White, a very light-skinned Black man who could “pass for white” and who became an official in the NAACP, not a “founder” as Danzig misstates. According to Danzig, White “went undercover with the KKK in order to investigate and sometimes prevent lynchings in the South. He was a hero.” In this role, Walter White was undoing what many white-skinned Ashkenazi Jews in the South had worked to establish to secure their place in the cotton-based economic infrastructure. Being well-represented among the major cotton traders of the South, Jews had as much or more to gain than any other white ethnic or religious group in ensuring that the Black man continue in the cotton-producing role he had been in for the previous 300+ years. And so it was in the case of the Jewish presence in the American Civil War. As soon as Lincoln heard of Grant’s order against Jewish traders, he rescinded it. But we should understand why Grant and those prosecuting the war against the Confederacy were so frustrated with Jewish merchants, traders, and peddlers. Jews were among those whites attempting (very often successfully) to break the embargo by smuggling cotton out of the South in exchange for gold. This gold was desperately needed to continue the rebellion of the slave states and to continue the slave trade. Danzig apparently expects that we—the descendants of the Black slaves and victims of the slave system these Ashkenazi Jewish merchants were intending to uphold—ignore this incredible Jewish betrayal and see these victimizers as victims?! Further, the “vicious anti-Semite” Ulysses S. Grant won the presidential election, taking the majority of the Jewish vote and becoming “one of the greatest friends of Jews in American history.” Danzig, in his futile quest to find “anti-Semites” finds only friends. Meanwhile, Blacks are reviewing Robert Rosen’s much more interesting book Jewish Confederates, which is filled with Ashkenazis who were willing to die—to die—to keep the Black man and woman in chains. It is a fat 517 pages long. In his third historical delusion, Danzig writes that “In Georgia, in 1915, Leo Frank was wrongly convicted of a crime and lynched because he was Jewish.” Danzig is here relying on white Ashkenazi “historians” who for 100 years have fabricated much of the Leo Frank story for the very purpose that Danzig now uses it—to convince uninformed Blacks that the lynching of a single Ashkenazi Jew for a murder he did in fact commit outweighs 360 previous years of Jewish slave-trading, KKK involvement, and Jim Crow collaboration. The Leo Frank case (which began in 1913, not 1915 as Danzig again misstates) is notable because it is credited with initiating the ADL, the racist forerunner of J. Edgar Hoover’s FBI COINTELPRO operation. 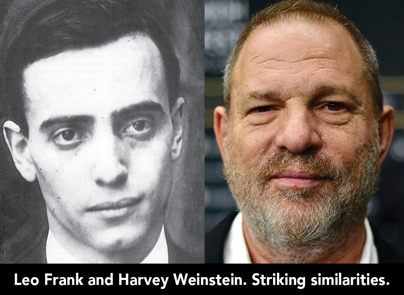 B’nai B’rith leader Leo Frank was the Harvey Weinstein of his era. He ran a pencil factory filled with adolescent Gentile girls, many of whom testified under oath that Frank often sexually harassed them. Frank cornered 13-year-old machine operator Mary Phagan, who resisted, and in the struggle he raped and killed her. And just as Harvey Weinstein hired Israel Mossad agency Black Cube to clean up his mess and tarnish his accusers, Leo Frank hired two nationally known private investigation firms to help him pin the crime on two Black men. Ultimately, both detective agencies were unwilling to corrupt themselves and they publicly stated that Frank was guilty of the murder. 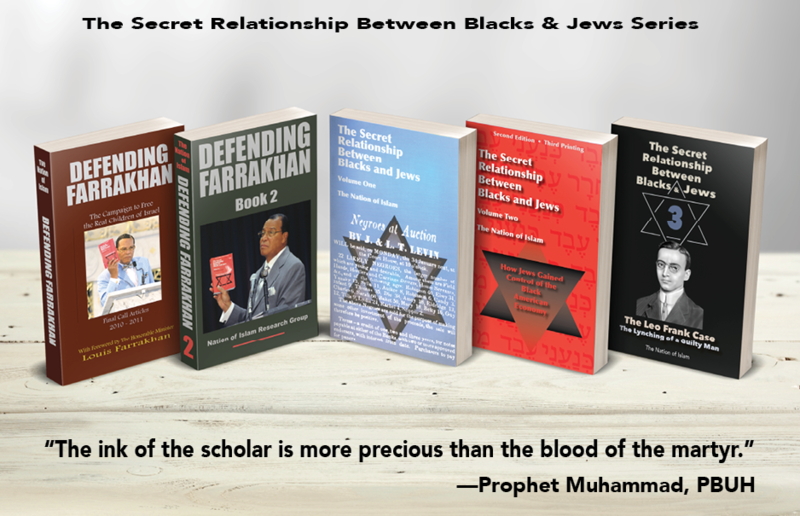 The Honorable Minister Louis Farrakhan has always maintained that a proper relationship with Jews must begin with an honest dialogue about how one people’s actions have harmed another. 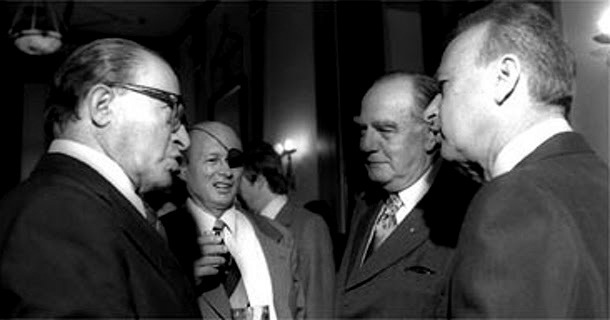 To simply deny that such a history of harm exists and that any other Black point of view is “anti-Semitic,” has been the arrogant Ashkenazi position against Black people and The Minister for 34 years. In their identically hateful reaction to the experiences and earnest opinions of Black Jews, white Jews have only helped prove that there is simply no Ashkenazi respect for Blacks of whatever faith, no matter how reasoned their points of view. Once Black Jews become aware of the massive role their Ashkenazi brethren have played on the oppressor side of the color line—and we have only scratched the surface here—it will give Blacks of the Jewish faith a new meaning for the Jewish seder tradition of leaving the door open for Elijah.